The best pop and rock songs about Godzilla and his movie monster friends: Mothra, Gamera. Best Godzilla themed songs from Blue Oyster Cult, Alphaville, Queen, Green Day and more. 1 - Godzilla (1977) by Blue Oyster Cult The obvious topper here is the FM hit song from BOC. 3 - Fire on High (1975) by ELO Electric-Light Orchestra for the big bad fire-breathing lizard. 4 - Woman From Tokyo (1973) by Deep Purple. That's all Gamera or 'Zilla ever wanted... their sweet woman from the city of neon lights. 6 - Flick of the Wrist (1974) by Queen from the Sheer Heart Attack album. A flick of his tail would bring down a good sized building. 10 - Heroes (1977) from David Bowie. 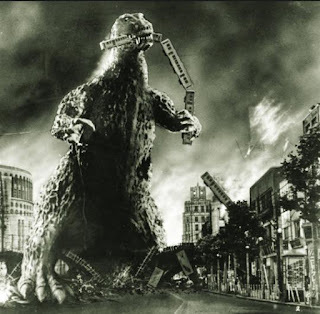 As first Godzilla is the villain, and then he is the hero for dozens of sequels, because there's always a bigger monster. Good times. 14 - Moths (1978) by Jethro Tull, for Mothra! 17 - Atlantis (1969) by Donovon. Way down below the ocean, where I wanna be. And there you have it: your Godzilla monster movie mix CD for the intermission in your next Gozilla movie marathon. Models and real sets beat CGI any day of the week. Rock on, Daikaiju!